Home > How To > Collecting > Any good ways to store minerals? Any good ways to store minerals? 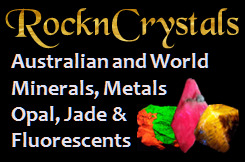 I'm just wondering if anyone has a good method of storing gems and other rocks so that they do not get damaged and so you can get to them easily. I've seen egg cartons used for crystals and stuff but I have larger, softer rocks that can get damaged easily. 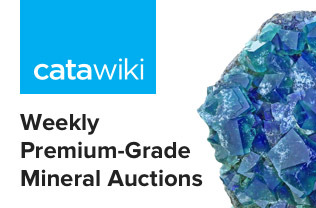 Mineral specimens are primarily meant to be displayed or shown off so storing them presupposes that you will not be repeatedly taking the specimens out of your storage to look at them or move around. Storing minerals and then frequently repeatedly taking them out of the storage for any purpose means they run the risk of being damaged. Store them only if you will NOT be looking at them with any frequency. I use plastic storage boxes. They are easily obtained in many stores including Walmart, Lowe's, hardware stores etc, etc. Sixteen quart size is an easily handled size for medium to cabinet size specimens. The plastic boxes are water proof, of good sturdy quality, and can be stacked, either full or empty. For packing, I prefer thin plastic type film such as for protecting clothes obtained at the dry cleaners. Crushed up newspapers or their plastic wrappers are also fine. Gently put the specimens into the box surrounded by the film until steady. More than 1 example can be added to the box, each one surrounded by the film so specimen movement is lessened. Label the outside of each box with masking tape so you know exactly what is inside each box. Then the boxes can be stacked and stored out of the way. Many collectors house their collections--at least the part not on display, which in my cramped living space is about 99 1/2% of it--in drawers of some sort. I am perpetually on the lookout for second-hand steel office filing cabinets with shallow drawers (6-8 inches/15-20 cm). The three I have currently, and am outgrowing as we speak, do their job very well, protecting the specimens from dust and light and providing ready access. Each individual specimen (most of mine are in the 2 to 6 inch range) sits in its own white fold-up box with tissue or paper towel padding on the bottom to limit rolling around as drawers are opened and closed. Thumbnails in Perky boxes live in an antique oak cabinet (inherited) of 1 1/2" drawers that I think was originally intended for photos or something similar. Edited 1 time(s). Last edit at 05/16/2018 05:18PM by Ed Clopton. Plastic (low-density polyethylene) is non-reactive to the vast majority of mineral specimens. It isn't made of fibers compressed together, so unlike paper, cotton, or synthetic batting material, will not leave loose fibers on the specimen. If not imprinted with inks or dyes, it won't transfer these to the mineral or react chemically. Some minerals can react or degrade when left in prolonged contact with printed inks. The main disadvantage of plastic is that it's not environmentally friendly; but you can reuse it, and you can actually help to recycle some of it by using it for such a purpose. In my opinion, very fragile specimens should be mounted in their own box, then stored. I would never take a specimen that might be easily damaged and just wrap it and stash it away without putting it in its own protective box. I highly recommend some kind of Drawer system. Not much point in having a reference collection if you can't refer back to them easily. They will take up more room than tightly packed and stacked boxes, but unstacking boxes to get to materials is a pain and good for long term storage only, stuff you're just keeping for whatever reason, that you don't need, want or intend to get back to anytime soon. Also agree with Hiro, all specimens within those drawers should have their own box of some kind (paperboard, cardstock or Plastic euro/perky display box) to keep them from ever bumping and grinding against one another. I also find the polyethylene sheet padding to be preferable to cotton or fiber padding. 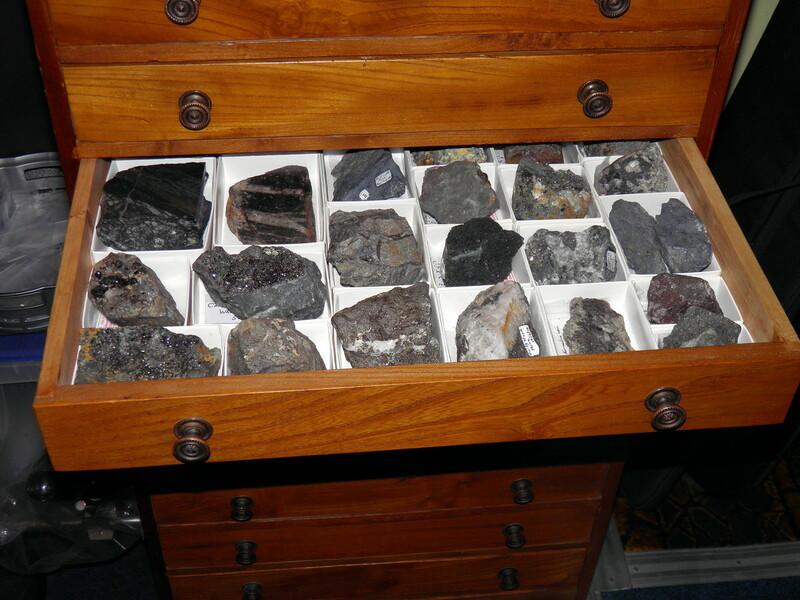 Almost all my mineral boxes have the bottoms lined with that material. I'm currently in the middle of building out my own custom drawer system (and will be for some time, it's a big job). The collection has gotten far too large for those "catchers catch can" solutions, and I'm looking forward to finally having uniformity, accessibility and interchangeable custom fit storage. Edited 3 time(s). Last edit at 05/16/2018 08:58PM by Mark Heintzelman. I like soft plastic film for packing specimens for shipment, as it is very gentle and can provide good cushioning. I do not use cotton at all because of the loose fiber problem, but I have had no problems with fibers from the paper towels and facial or bathroom tissue I use in specimen boxes. Paper fibers would be a problem if specimens are going to be examined microscopically, so plastic would be better in that case. Paper is mostly OK,,,, except when it gets wet, tho paper towels hold up best when wet. They come in two main drawer depths that are suited to differing sized specimens. For the larger pieces I have an old Globe-Wernick lawyers type bookcase and another display case. You should also give attention to the fact that some minerals (blue fluorite, proustite realgar etc.) are very light-sensitive. 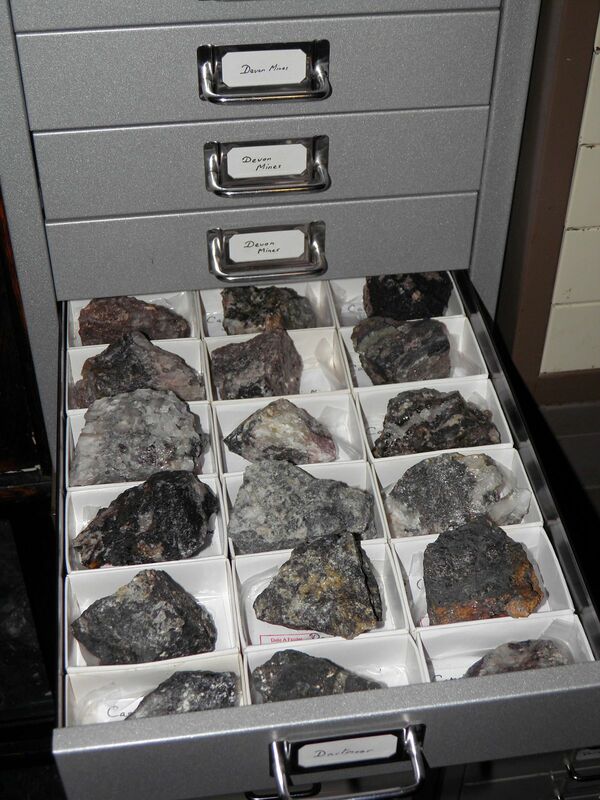 These minerals should be stored in a drawer and not presented in an illuminated showcase. I don't have long time experience with toilet or blotting kitchen papers, but paper from daily newspapers tends to become brittle and break in fragment with time, and it could stain some sensitive specimen. And paper from magazines is usually not soft enough. Comment on using newspaper for wrapping mineral specimens. First, I agree with Luca, it only lasts a few years. Second, if the mineral is pyrite or marcasite, iit may not be there when you return. newsprint seems to hasten "pyrite disease"
The plastic bags from dry cleaners are used by lots of mineral dealers. It works pretty well for most anything, and you can often get it for free. I like Viva paper towels, they are almost cloth like and kinda stick to themselves to stay closed. On more delicate specimens, I wrap them in a layer of TP first. For travel, I have several friends that use gun cases. These can be picked up at most sporting goods stores for a reasonable price. Travel in general is not recommended for delicate pieces. I cut up plastic grocery bags to wrap minerals in. I used to use paper towels but they always left 'fuzzies' on the sharp corners. The plastic grocery bags solved that problem, they are free, and easy to cut and use. Sometimes it takes a larger piece to adequately protect specimens but it works very, very well. You talked about "storage" and I wondered if you were talking about what the above people have already mentioned or "overflow" material you don't need to get to all the time. We have the drawer system for our collection but for further storage we have "stock" and in the US many people use the cardboard "beer flats" that they ship beer, soda and many other products to stores. We use those in bottoms and lids for storage. Hope this helps a bit. I make the paper boxes for the individual specimens in most cases but often they can be purchased already cut to proper size only folding required. Attached is a reference article on curation of geological materials which I used as a basis for drawing up guidelines for our club mineral collection. There is a section on storage and the authors recommend not using oak or birch in storage cabinets as these woods can release vapours harmful to minerals. I use a metal case from IKEA called "the Helmer." It has 6 drawers and holds specimens to 2.75 inches tall. They are relatively cheap (about $40.00 US each) and 6 of them can fit on those 36 inch wide wire shelves available at Target and other stores (also about $40 each). 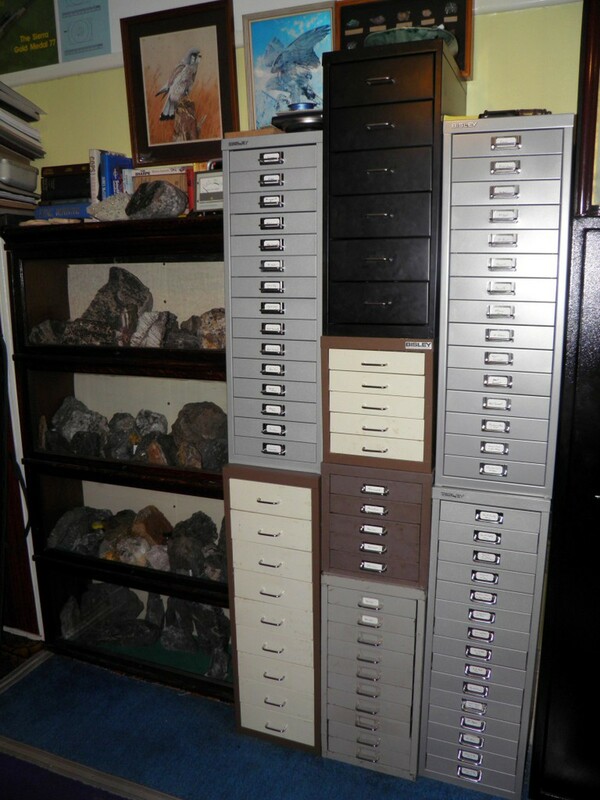 I don't attach the wheels and I can store roughly 12 specimens (miniature to scab) per drawer, 60-80 specimens per case or 360-480 per shelving unit. It costs less than $1 per specimen to store them this way, the appear neat and organized and don't take up a lot of space. Inside each drawer, specimens are held in individual boxes with labels. Ideally these could be a little taller, on glider slides, and lockable but they serve my purpose. 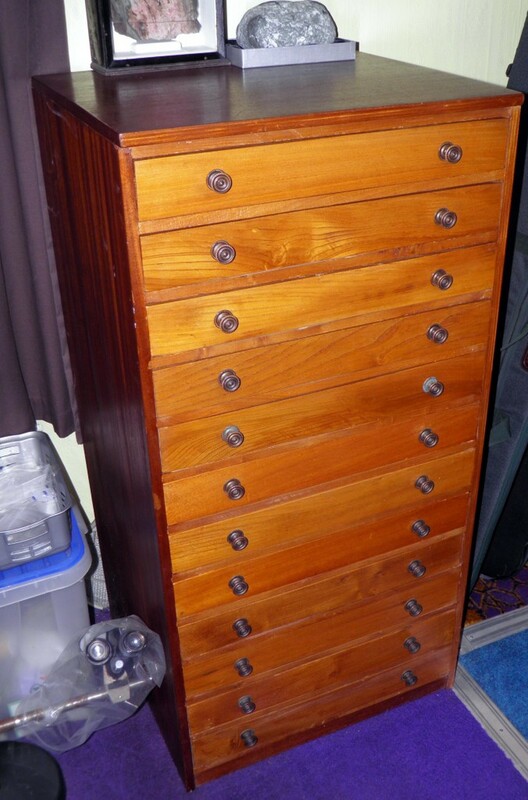 One warning is that the drawers pull out all the way (no stopper). That is good for the collector but can be problematic if you have visitors who do not know they pull all the way out. For larger specimens, I use flats and boxes. I have several display cases, but not enough room to display all specimens. The Helmer cases make a simple and quick way to inspect specimens. I can also easily organize my collection by Country, State, for quick comparison.